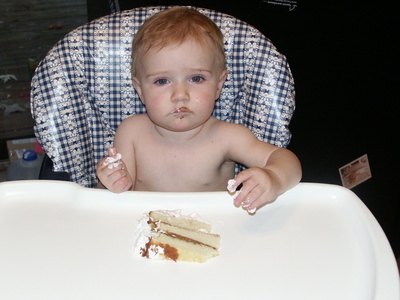 I've always thought that no one-year-old *needs* a birthday party. The world is certainly not going to implode if a person who is incapable of grasping the concept that it's her birthday fails to have the bash of the year in celebration. I've gone on record with this opinion, and if you'd asked me six months ago if my child would be having a party for her first birthday, I would've said no way. What parent of a baby has the energy for something like that? But, eh, we decided to throw one anyway. We've got more energy now than we did six months ago, and we also happen to actually enjoy having people over, so it wasn't like throwing a party would be painful. Plus, it turns out our child is pretty sociable, and loves it when a lot of people are around, especially if some of them are short like her. 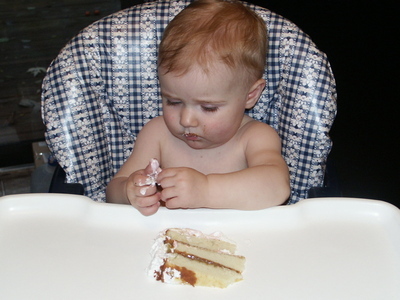 The party was two weeks after her actual birthday for the same reason that Camilla's spent about 8 weeks' worth of nights in beds other than her own, despite being only 54 weeks old. We go places a lot, and we do stuff, and so do the people to whom we're related, so the 27th was the first day that would work. I'd like to say that I anticipate in future years we'll be able to have her party on the 14th like it should be, but along with being busy we're also not very organized, so the chances are slim. 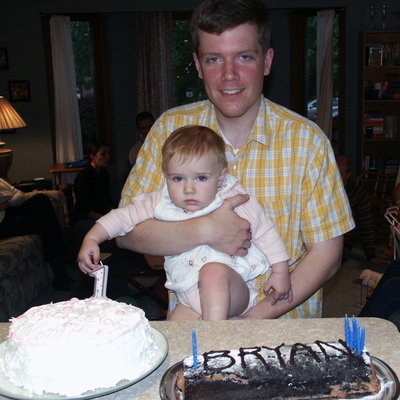 Anyway, this year's party was technically for both Bryan and Camilla, since his birthday's four days after hers and I didn't want him to feel left out, not that he cared. This changed the nature of the event not at all, except that I made two cakes instead of one. I can't take credit for how the cakes look, because my youngest sister kindly decorated them for me. 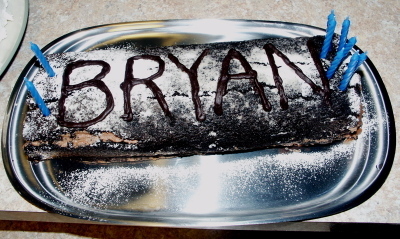 I can take credit for the taste, but unfortunately it's hard to share that over the Internet. I do have bandwidth limits, you know! I tried to get a picture of the birthday people with their cakes. 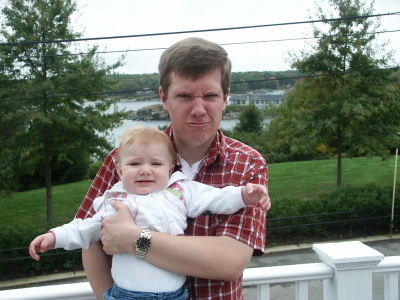 As you can see, Milla was not such a fan of that. I think she was mad that we were keeping her from her adoring fans and her brand-new toys. 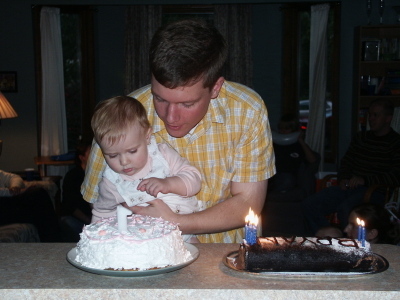 She also didn't quite get the blowing-out-candles thing, and had to be assisted by her father. Maybe next year she'll figure it out. We gave her cake, of course. It's obligatory. I don't think she actually ate any of it, though. She's such a weird kid. Tonight she was a huge fan of the homemade split pea soup I gave her, but cake? Nah. She mainly just played with the frosting. What IS this strange fluffy white stuff? And why do you keep taking pictures of me? I have to admit that I sneakily nursed her right before we gave her cake, hoping to avoid having a baby with a huge sugar high. Also, we gave her yellow cake and I'm sure she would have preferred chocolate, but I'm not crazy. The kid sleeps badly when *I* eat chocolate in the evenings. Giving it to her would be an act of lunacy. 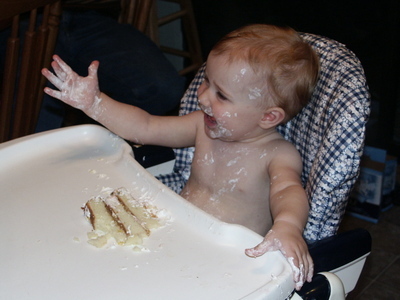 She did have fun painting herself with frosting, even if none of it went in her mouth. Thank heavens we stripped her down beforehand. A quick bath, and she was as good as new. I figured out the white stuff! Don't I look pretty? Thanks to my very sensible husband and his voice of reason in the face of my Hostess Complex, I managed not to over-plan (much) on the food, and thus didn't have to kill myself with preparations, which was nice. Our daughter had so much fun that I barely saw her during the entire party, and considering that she is the ultimate mama's girl, that's saying something. It was a nice break for me, too. 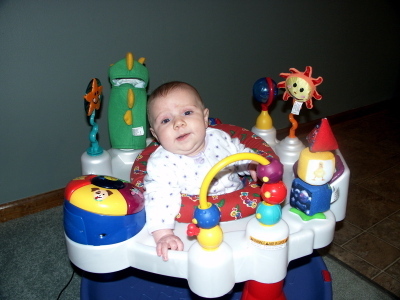 I'm thinking about throwing another party just so I can get people to play with my kid. 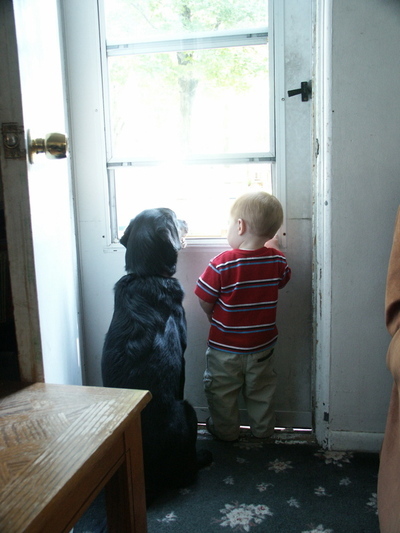 As it always seems to go at such things, the best moments were the unplanned ones. 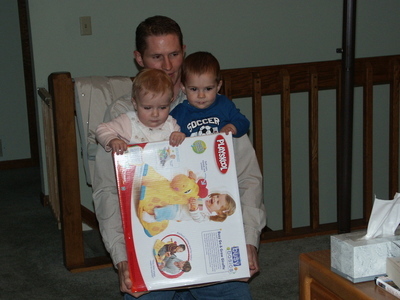 And the best toys were not the toys themselves, but the boxes they came in. Year One has been duly celebrated. Bring it on, Year Two! Camilla's birthday was almost two weeks ago, but I've got to keep up my street cred as a procrastinator, so I couldn't possibly finish her birthday video more than twenty-four hours before her actual birthday party, which is tomorrow. The song you'll hear on the video is a hymn that's been around for a while, set to music by Fernando Ortega's. We got the album when Camilla was a newborn, and I was drawn to this song and have sung it to our daughter from the first days of her life. For me it is the soundtrack of what she is to us: proof that His faithfulness is indeed great. I've already written about the first two parts of last week's trip to New England - our time in Cape Cod with friends, and our time in Maine - but I didn't get to the third and final part, which was three nights in New Hampshire with relatives. Also, pictures! 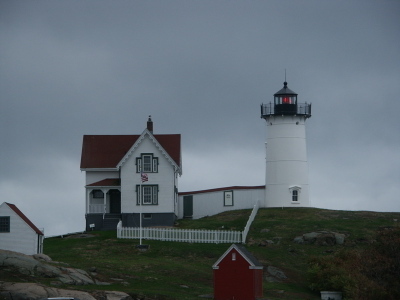 Maine is cool and lighthousey, and this is the Nubble Light, which was not far from where we stayed. The area is pretty touristy but we were there in October, so it was not crowded, which totally made up for it being windy and chilly the morning we visited this lighthouse. This is the view from the balcony of our room at the York Harbor Inn. Milla did not really want to have her picture taken, as you can see. Bryan is just funny-looking like that. That's a little sliver of the Atlantic Ocean in the background. I don't know if it's because we grew up in a town that is right on one of the Great Lakes, but Bryan and I both agreed that we found the neat historical buildings and the fishing boats and whatnot far more interesting than the big body of water. People who have never seen the Great Lakes tend to think of them as being just like other, normal-sized lakes, but from the shore, Lake Huron or Lake Michigan or any of the others looks pretty much just like the ocean. So we were kind of... over the ocean. Huge body of water? Been there, done that. It was still really cool to be in Maine, though. After Maine we drove a whopping eighteen miles to New Hampshire to stay with my dad's sister and her husband and my cousins David and Sarah. All of them were great with Camilla, and if they hadn't already been loved ones by virtue of being dear relatives, they would have won my heart just by doting on her the way they did. The town they live in is happily historic like all of New England (compared to Michigan, anyway). 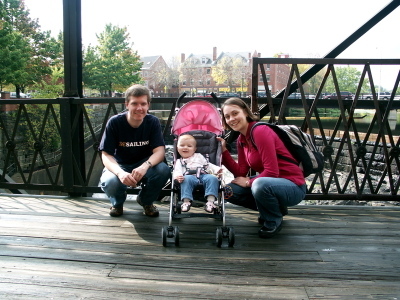 The below picture is of us on an historic bridge over a waterfall that ran historic mills, with historic buildings in the background. If we were still in elementary school, we SO would have gotten extra credit points for that trip. One of the things we visited while we were there was a little apple orchard, pony ride, pumpkin patch dealio (surprisingly and delightfully uncommercialized, plus they had unpasteurized cider). 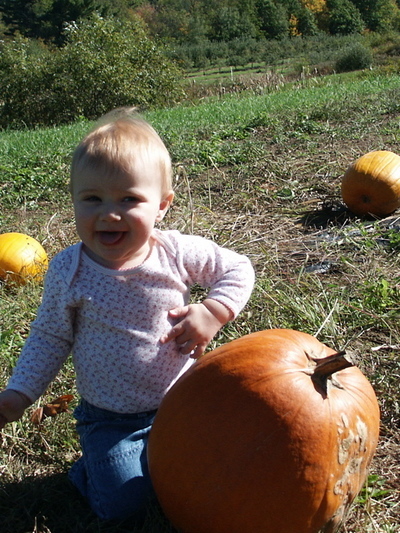 I've always, Scrooge-like, scoffed at people who took pictures of their kids in pumpkin patches. It's so posed! So cliche! But now I understand. If you have a child and a camera and you come across some pumpkins sitting in a field, you can't NOT take a picture. Those pumpkins exert some sort of magnetic pull. It is powerful. And you know what? The pictures actually turn out pretty adorable, if your kid is cute enough. I've wanted to take a trip to New England in the fall for as long as I can remember, and now I've finally done it. 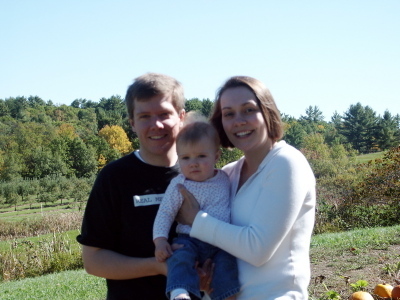 And with my own little family, no less, which makes it much more than just a fun experience. It makes it something priceless. I seriously can't believe I am doing this, but to avoid another email from my brother it is necessary. If he gets on me about the fact that this is not a real post but merely a stop-gapper, I'm going to have to sic Joe (our parents' dog) and Daniel on him. They are fierce. Real post coming tomorrow, which also happens to be my dear husband's birthday. Twenty-seven years. Ouch. (This was meant to be finished and posted last night, but I chose sleep over blogging. No one called me on it except my brother, from whom I got this email: "It is 12:08 Tuesday morning where you are. Need to get and stay on the ball. Make sure I get a mention in your next post for keeping you honest." Hee. He's so cute and military-ish now. 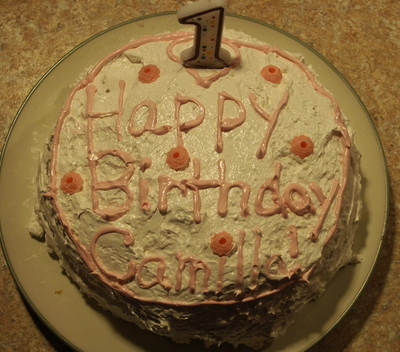 Sunday, October 14th was Camilla's first birthday. I know the year-in-review birthday photo post has been done other places*, and I can't claim to have thought of it first. But hey - I thought of it TOO! That has to count for something. 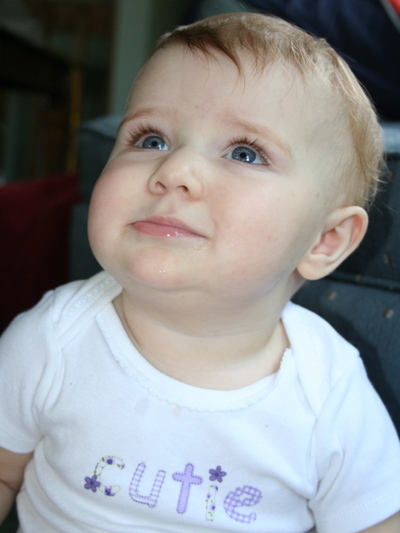 Month One was when we met our long-awaited Camilla Claire. I was totally unprepared for the huge love that absorbed me from the moment I first saw that little blue, vernix-covered face. I still get shivers thinking about it. 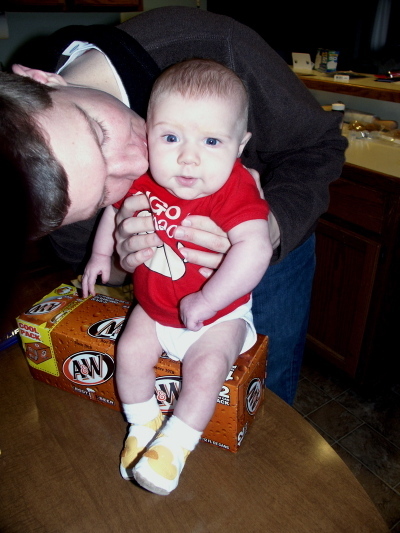 Falling in love with my daughter was what made recovery and the challenges of brand-new parenthood fade into the background. Month Two was when those challenges got big enough to resist fading into the background. 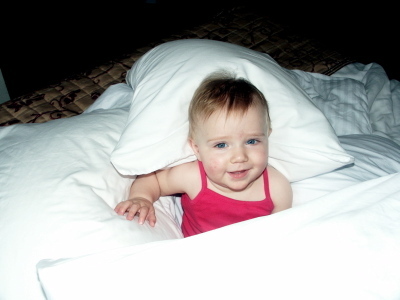 Camilla looks so peaceful in this picture, but she was very fussy at this age. She cried so much that I often cried too, out of sheer frustration and exhaustion. Life during those weeks was a day-in, day-out object lesson in the truth that love is much more about commitment than it is about feelings: it was commitment that gave us the strength to pace the floor at 3:00am, to keep going, to keep caring for a fussy, high-needs baby when we felt like our own resources had been completely zapped. Month Three had quite a bit more of the same. We were not unhappy, but neither were we relaxed and enjoying ourselves. We were contented but worn. In retrospect, it occurs to me that maybe this is what new parenthood was supposed to be about: being pushed to the edges of our sanity, being almost - but by the grace of God not quite - broken, so that we could have the chance to realize the enormity of the task we'd undertaken, and to commit ourselves fully to this new person and to each other. In Month Four we got to start reaping the benefits of that commitment. 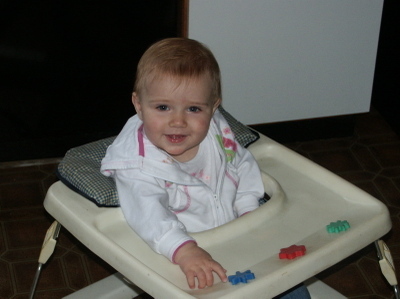 Thanks to decreased fussiness and increased interactiveness on the baby's part, and some well-honed coping methods on our part, we started really getting to enjoy our child. In Month Five I was thrilled to find that the fussiness finally seemed to have left us, thrilled to find that it was actually possible to get a decent amount of sleep, and slightly dismayed to find that once babies aren't newborns any more, you actually have to entertain them. Who knew? 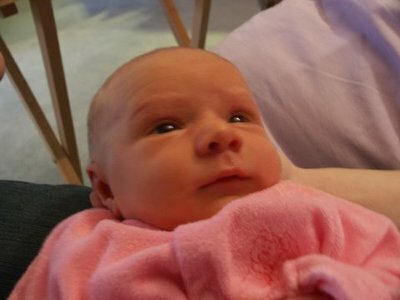 Also, looking back at the pictures reminds me that it was around this time that Billa started to lose her newborn looks and grow into the face she sports so prettily now. Month Six brought more discoveries. 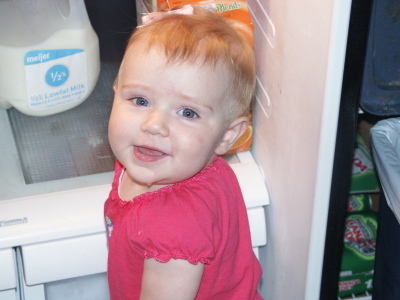 Like: Hey, the baby isn't just a high-volume bundle of needs, she's a person! With a personality! A fun and enchanting personality! And also, she screams bloody murder when her mother leaves the room, even just to go to the bathroom! Still, the good far outweighed the bad. 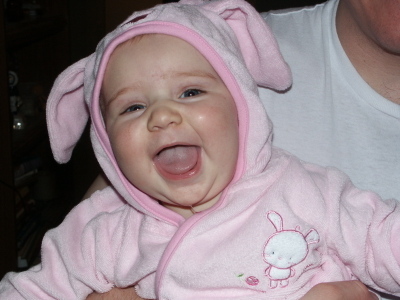 Is it redundant to mention how much we really, really love our daughter? The worst part of Month Seven was the time we drove 300 miles in one day, and it's a good sign when the worst part of your month only lasts six hours. We did swear that for any infant-accompanied trip longer than that one, we will hereby always and forever take an airplane, but the hell of six hours in a car with a restless baby was over in a flash, and we seriously enjoyed the rest of the month. As you can see, above. In Month Eight my sister came to live with us for the summer, which was beneficial for all concerned. 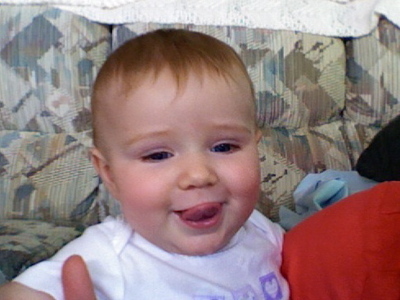 Having her around made my life a lot easier, plus Milla just kept getting more and more fun. 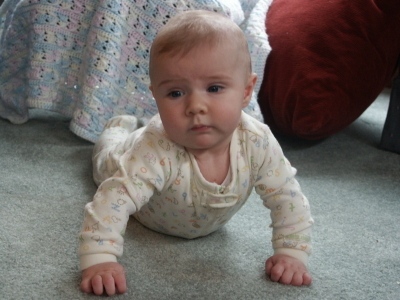 A highlight of this month was that she finally started rolling over back-to-front. 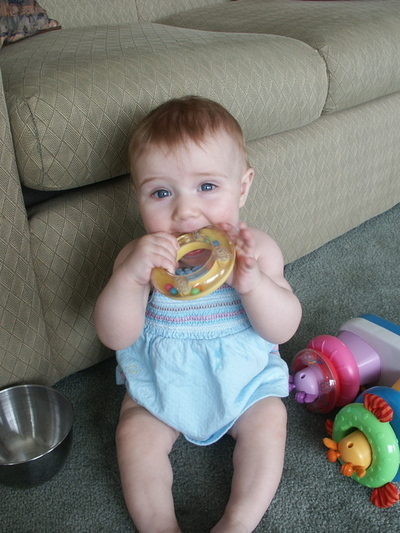 Her gross motor skill development seems to indicate that she has inherited her parents' lack of athleticism. When she doesn't make the volleyball team (or any other team except quiz bowl) in high school, she is so going to blame us. Month Nine was Camilla first started really interacting with Daniel, which is to say that he was tenuously walking, so he'd regularly toddle into her and accidentally knock her over. Heaps of fun for all concerned, but she loves him beyond belief anyway. She also started crawling near the end of this month, and I think it's safe to say that a little coordinated movement of hands and knees has never made me so excited before. With Camilla finally crawling, I learned in Month Ten that babies who can move themselves across the room are much more difficult to watch. My days of sitting on the floor with my laptop while the Billa played happily next to me - without once attempting to GET my laptop - were over. Fortunately, the trade-offs were good. 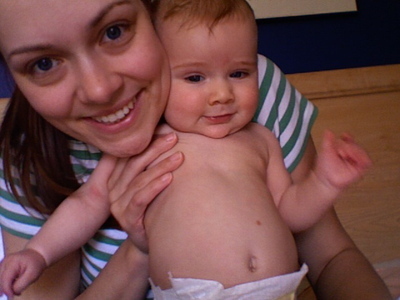 I love having a mobile baby (MoBaby). 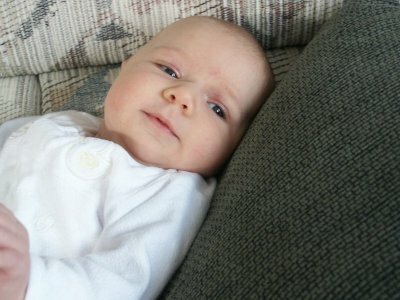 During Month Twelve we started realizing that our baby was disappearing, leaving in her place an active, interactive almost-toddler with quickly-developing verbal skills, a sense of humor, and an infectious delight in the conventions of daily life that made us begin looking at the ordinary with new eyes. The refrigerator and the dishwasher are wonderlands; a simple book, read dozens of times already, is an adventure: what will the duck and the horse say this time? ; a bowl of ice cream is not just a snack, but a hundred chances for a bite of pure bliss. To say that life is better now... well, wouldn't that just be the understatement of the year? *Special apologies to Emily. My due date was three days after hers, I gave birth four days after her, and now I'm doing the birthday photo post six days after her. I'm sure she thinks I'm a big fat copycat - I hope she remembers that imitation is the sincerest form of flattery.